A big thank you to Enemies Of Promise frontman and Revolution Rock presenter Ade Bailey for rushing back from the pub to answer my last minute SOS for someone to pen a guest review. 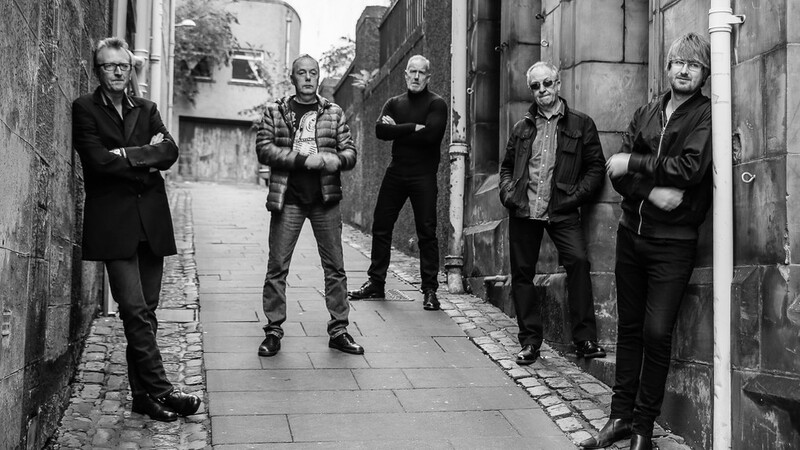 He's chosen to write about the first new album release in 36 years by legendary Scottish band The Skids. Where my write ups only ever mention the positives from a release, Ade goes into what he sees as both the ups and downs of the album. As a massive fan of The Skids, I think he's as good a person as any to give it an honest appraisal. Before I hand over to Ade, an apology to anyone who might not be able to watch the video. I notice it's a Topic video which I think will mean it's copyrighted and not available to view in certain countries. I was tempted to upload the song onto Youtube myself so everyone could check it out but as The Skids are a big band I thought there was a good chance the label or copyright holder might get upset. If you can't watch the video, try and track the song down anyway as Ade highly recommends it. What can you say about The Skids that hasn’t already been written a thousand times? Seminal band of the late 70’s and early 80’s, a canon of genre defining singles and albums to back them up. So here we are, years down the line, the loss of Stuart Adamson and several one-off gigs later, a brand new album and re-invention of the boys from Dumfermline. It is with pure fan-boy eyes that I review this record – The Skids meant almost everything to me as a teenager and it was with a sense of trepidation that I spun the record. It opens with ‘This Is Our World’ a solid track to kick off no doubt, but it’s only with ‘One Last Chance’ hear the echoes of the old band that made us all swoon and fall in love. It’s truly those hinted-at Adamson guitar moments that really make this album shine. You can be listening and nodding along…yeah all is good…great song..then BANG! A riff or subtle phrase from Bruce Watson’s guitar will make you remember Stuart and the large shadow he casts over this piece of work. ‘A World On Fire’ was the lead single from this album and it does the job with only slight reservations I’ll go into now. The mid-point gives us ‘Refugees’ a ballad exploring one of the most pressing topics of our time. It’s ok – but just that, ok, and here lies the biggest flaw with this album, the lyrics. I’m not sure how the lyric writing was apportioned back in the day but this record suffers from this glaring problem. Much like the last SLF album, the tunes are hamstrung by some very lazy writing. There are more than a few ‘Moon/June/Soon’ moments as I like to call them. Such obvious rhymes, you can predict them even on first listen, and that’s a shame.A shame especially when you hear a track like ‘Kings Of the New World Order’ which is quite simply head and shoulders above anything else on this record. If they had given us another 9 of this quality I would have hailed this album worthy to stand alongside ‘Days In Europa’ and ‘Scared To Dance’ Don’t get me wrong, it’s a worthy come-back album, better than some I could mention (though the less said about ‘Desert Dust’ tacked on at the end, the better) and the live shows are incredible, heavy on the old material that they are.